In reviews Baars’ music has been characterized as joyfully obstinate, but surely appealing and as colourful as it is astonishing. It embodies the best typically Dutch improvised music has to offer. Although he seldomly uses recognizable song forms or ongoing swing rhythms, the music stays catchy, because it is stripped to the essence and clearly presented. Influenced by the American saxophonist Roscoe Mitchell, whom he worked with in 1986, and by his participation in the Monk Project (performed by the Instant Composers Pool, directed by Misha Mengelberg), Baars adopted a very personal style, or ‘ab music’ as Misha Mengelberg calls it. 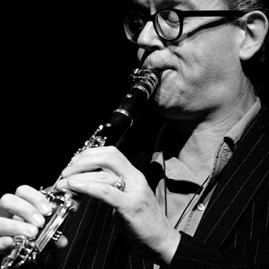 So far, Ab Baars has worked with improvisers such as Han Bennink, Jaap Blonk, Alberto Braida, Anthony Braxton, John Carter, The Ex, Cor Fuhler, Ben Goldberg, Tristan Honsinger, François Houle, George Lewis, Michael Moore, Sunny Murray, Sonic Youth, Fabrizio Spera, Cecil Taylor, Roger Turner, Ken Vandermark, Veryan Weston, Wolter Wierbos, Michiyo Yagi, poets H.C. ten Berge and Diane Régimbald, dancers Beppie Blankert, Hisako Horikawa, Masako Noguchi and Katie Duck’s Magpie Company.